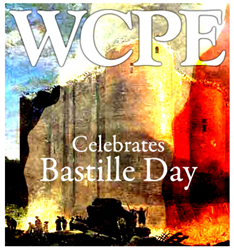 WCPE Music Director William Woltz announces a program celebrating Bastille Day on Friday, July 14, 2017. WCPE Music Director William Woltz announces a program celebrating Bastille Day on Friday, July 14, 2017. A few short years after the United States gained its independence, the French threw off the tyranny of their absolute monarchy with the storming of the Bastille.